Amy's Creative Pursuits: Having Fun Locally: Chalkfest! I am continuing another "Staycation" travel post with a visit to our local university to see the "Chalkfest" art. My past two "Staycation" posts involved visits to local parks: "River Prairie Park" and "Irvine Park". 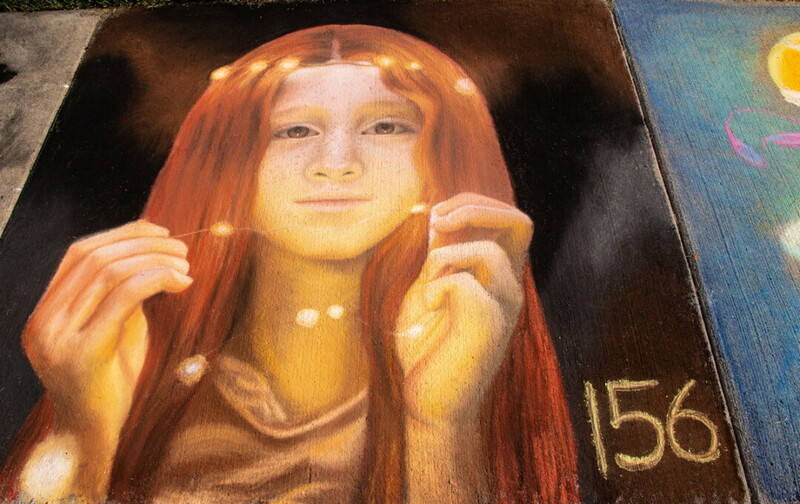 Every year the University of Wisconsin-Eau Claire is taken over by artists of all ages creating works of art in chalk. Visitors can watch the artists as they create their magnificent art. They can also vote for their favorites. In addition to chalk art, there is food, music, and chalk-related games. There is also an area for younger kids to participate in a chalk mural. I've never been to Chalkfest before, I saw the pictures of the event after wards on Facebook. I was looking for something to do with my daughter, son-in-law, and granddaughter and thought this would be a fun, local activity. We missed the day of the actual event and arrived a few days later. Even though it rained, and a landscaping tractor ran over some of the designs, we were still able to enjoy the art. I would however, like to see the chalk art next year, the day it's done, before rain or people ruin it. Here are some of my favorites. I took the pictures before I knew which ones won any awards. I was surprised how many of my favorites were winners. I must have good taste! This one won an "Honorable Mention" and was created by a youth group. Another youth group winner. It won an "Honorable Mention" as well. "Wonder Woman" was voted audience choice. I can certainly see why! Such amazing detail! I just love the vivid color in this one. I was surprised to see that this one did not win any awards. It was one of me and my daughter's personal favorites. It looked like a painting in person. So well done. So beautiful. So much color and cuteness in this one! The bird lover in me loved this one! There was more than just "pictures" at the chalk fest. Many were intricate, geometric designs. Those seemed really hard to draw to me. How do the artist's get the dimensions so precise? This beauty won "Honorable Mention" by an adult individual. This black and white elephant was amazing to me. I couldn't believe it was done by a child. It won Honorable Mention by a youth. And one for the David Bowie fans! And the winner I never saw in person so I took this photo from the Chalkfest website. Is this incredible or what? I can't believe I missed it in person. Wow! It looks so real, it's hard to believe this was made with chalk and not oil paints. I'm impressed, you? It won 1st Place and it was created by an adult individual. Chalkfest is held every year on the Eau Claire campus. It is open to anyone 12 years of age and older. So what do you think? Aren't all these chalk creations amazing? Which one was your favorite? I'd love to hear from you. Amazing chalk art! I've seen paintings done before, but also after the show was over (the next day). It would be amazing to watch the artists doing it! Not sure I could pick a favorite, they are all pretty impressive! Yes, I definitely want to make a point of attending the festival while it's gong on next year. Isn't it a great idea? You should start one in Australia! That is a great idea since you get little to no rain. We have one of these festivals every year and are addicted....it's just SO amazing to me how talented these artists are!! You're so lucky Jodie! This was my first experience attending one. Yes, the art is amazing! Thanks for visiting Debbie! Yes, it is! Thanks for visiting! Some very talented people, awesome! Yes they are! Thanks for visiting Dee! How FABULOUS! This reminds me of a scene in Mary Poppins :) I wish I lived closer so I could attend the festival in person. Oh, maybe there is a festival where you live and you just don't know about it. I've lived in the area a long time and first heard of the chalk fest this year. Wow those are really fabulous! I just love the jellyfish one. That seems to be a popular one! Thanks for visiting!